No classic drum kit is complete without a basic set of cymbals, which can be further expanded with a wide range of different effects cymbals. Of course, there are also marching cymbals and cymbals for large orchestras. To give you a better idea about the full range of cymbals available, we have prepared the following shopping advice on the subject: How to choose cymbals. The beginning drummer choosing their first cymbals soon realises that there is a huge selection of cymbal types available, including their different variations. Cymbals differ not only by type, but also by the materials from which they are made and the way they are manufactured. Other parameters important for your choice are thickness/weight and diameter. 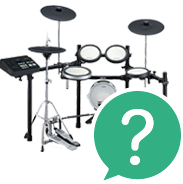 The basic set of cymbals from drum kits includes: ride, crash and hi-hat cymbals. This basic set can be supplemented according to your needs with effects cymbals such as China, splash and bell cymbals. The selection of cymbals is naturally much broader, and there are also various complete cymbal sets on the market. Please note that manufacturers state diameters in inches, while describing thickness and weight with the terms thin, medium and heavy. We will be delighted to provide you expert advice in choosing your cymbals. You can call us at 020 8089 1481 (Mon-Fri, 9 a.m. - 5 p.m.) or send us your questions by email to . The sound produced by cymbals is determined by the quality of the alloy, the production method and the specific dimensions and shape of the cymbals. The oldest cymbal manufacturer in the world is Zildjian, which, amazingly, has used its own secret formula for producing its famous cymbals since 1623. Copper/tin alloys (+ other possible admixtures) and alloys with a foundation of copper and zinc are most frequently used to make cymbals. Cymbals with zinc are usually less expensive than those with tin. However, the quality depends greatly on the ratio of metals in the alloy (e.g. a higher share of tin than copper typically produces cymbals of higher quality). Other alloys are also used (e.g. nickel and silver). 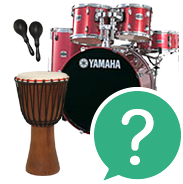 Hi-hat cymbals rank among the most common types, and a drum kit without a hi-hat simply isn't a drum kit. Hi-hat cymbals are specific in that they are made up of a pair of horizontal cymbals, with the top one controlled by a foot pedal (thus changing the resonance of the cymbals). The sound of these cymbals is characteristically penetrating and typically serves to keep the beat of the song. 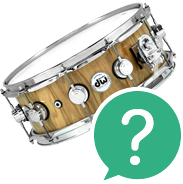 The most common hi-hat diameter is 14 inches. Crash cymbals are a standard part of classic drum kits. In fact, many drummer prefer to have at least two crash cymbals in their kit. Crash cymbals are also used in symphony orchestras. As their name suggests, these cymbals have a strong, sharp and distinct sound. The most common crash cymbal diameter is 16 inches. Ride cymbals are part of nearly all classic drum kits and serve to maintain the tempo. This type of cymbal is characterised by a distinct 'bell' sound and a longer sustain. The most common ride cymbal diameter is 20 inches. Hi-hat, ride and crash cymbals are a drummer's basic line-up, one that can be expanded as needed to include a wide range of other types of cymbals. These include popular China cymbals with their typical sharp and explosive sound. Some drummers prefer splash cymbals, still others prefer bell cymbals, and so on. And sometimes drum kits even feature highly atypical and unusual types of cymbals. There are almost an infinite number of possible cymbal combinations, so don't be afraid to experiment and combine! Don't forget that you'll need the most essential accessories for cymbals, especially cymbal stands. Cleaning products and protective emulsions could also come in handy. But be careful: these cleaning agents must not be used on certain types of cymbals because they would damage their surface (specifically Dry, Dark and Zildjian Kerope cymbals).